-Raid is a 2018 Indian period drama and crime thriller film directed by Raj Kumar Gupta. 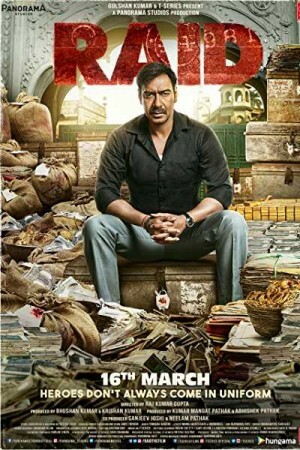 Written by Ritesh Shah and featuring Ajay Devgn in the role of an honest and courageous IRS officer, the movie is inspired by the real-life Income Tax raids carried out by the IRS in the 1980’s. The story of the film is set in Lucknow and revolves around Amay Patnaik, a brave Income Tax officer, who conducts a raid at the house of a powerful and corrupt political leader Tauji, played by Saurabh Shukla. Amay receives an anonymous tip about Tauji’s illegal assets and sets out to expose him and to bring him to justice.